A romantic odyssey to Ladakh is filled with thrill, adventure, deep dive into historical monuments and traditional Ladakhi cuisine. A Himalayan paradise tucked away between the verdant Kashmir Valley on the west and the rustic Tibetan valley on the east, Ladakh is a dream destination. Desolate, unpardonable, unforgiving, majestic – words fall short in describing the beauty that is Ladakh. 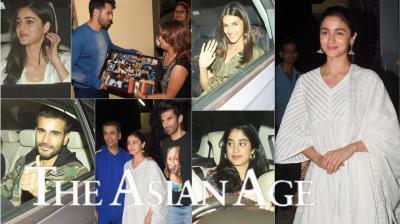 It was the first ever trip of Mousumi and I together to Ladakh. While, I had been to Leh twice before, it was our (Mousumi and I) first trip together. We stayed at The Grand Dragon Ladakh hotel and had a week at our disposal to design our itinerary. We decided to go slow and took one destination at a time. The majestic ‘Desert of the Himalayas’ is blessed with a rich history, and charming and quaint hamlets that makes it an eternal favourite among historians, travellers and adventurers, the world over. 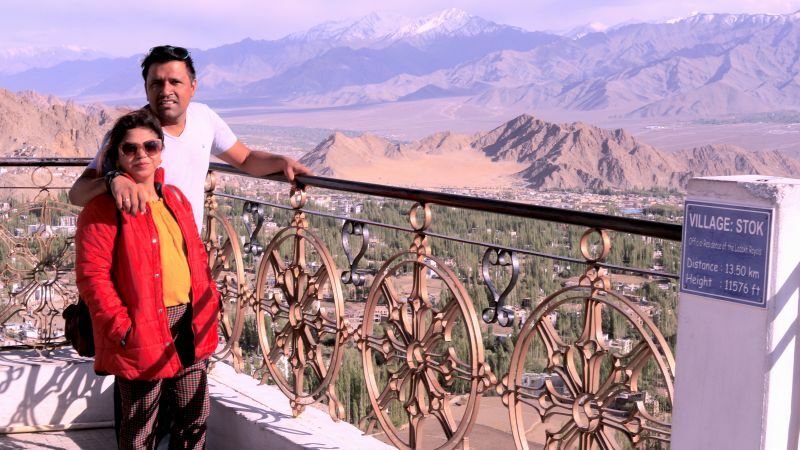 Our romantic odyssey to Ladakh was filled with thrill, adventure, deep dive into the historical monuments and delicious, traditional Ladakhi cuisine. Here are 7 insane reasons to fall in love with Ladakh. Ladakh and road trips go hand in glove. 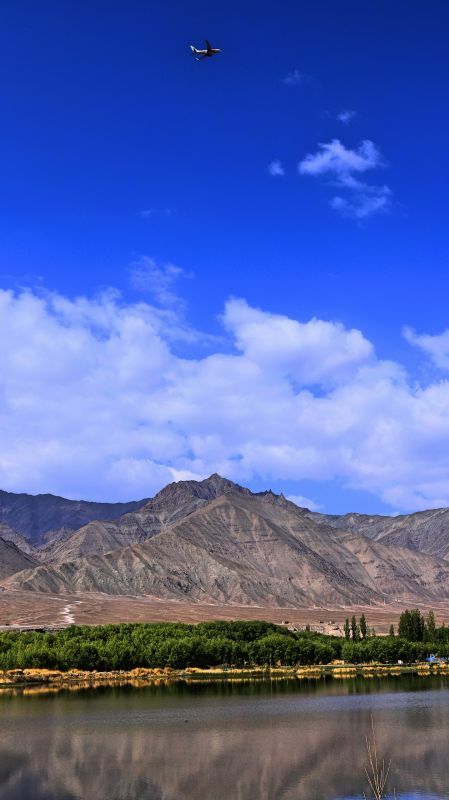 Move a bit out of Leh town and you are blessed with wide, unwinding highways (Leh to Kargil and Leh to Manali) on the eastern and western flanks of the town with unmatched views of hamlets, River Indus, chortens and monasteries on both sides of the roads. The Grand Dragon Ladakh understood our requirements quite clearly and spaced out our travel in such a way that gave us the opportunity to witness the majestic roads of Ladakh. We were also lucky to have our culture tourism guide Tashi Phunchook who interspersed our road trips with his local knowledge. The 70 km road trip from Leh to Alchi Monastery and Lamayuru Monastery, the 45 km road trip from Leh to Hemis and Thiksey Monasteries; and the epic, grudgy, dusty, six hours Leh to Pangong Lake road trip via Changla Pass took our breath away. This epic 17th century monument overlooks the Leh town from the Namgyal hill. It was the erstwhile seat of the Royal Kingdom of Leh. It was a short 5 minute drive from The Grand Dragon Ladakh and we rightfully choose the golden hours for the visit. The grand palace quietly snuggles itself in the lap of the hill and is today one of the most significant landmarks of Ladakh. It is built on stone, wood, mud and sand. The palace significantly shows some of the best medieval Tibetan architecture and contains a museum of old photos. It also has some hundreds of year old paintings. The nine storied Leh Palace is in ruins and is currently maintained by the Archaeological Survey of India (ASI). While the spectacular locale provides fodder for some wonderful photography, the palace, however, does not allow for it. 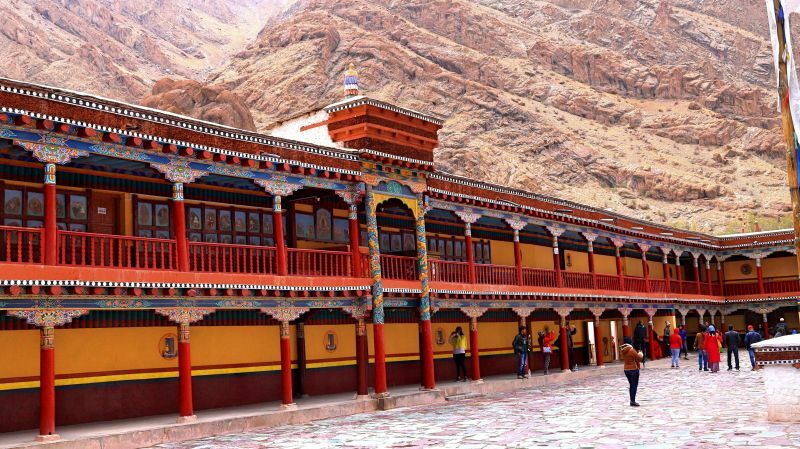 Tucked away in Hemis, the oldest monastery in Ladakh is situated around 45 kms from Leh. It took us a solid two to three hours for covering the entire Hemis monastery. It also houses a Museum that contains several precious religious treasures. ‘It is one of the most richest museums in Ladakh’, said our cultural tourism guide Tashi Phunchok. Indeed. 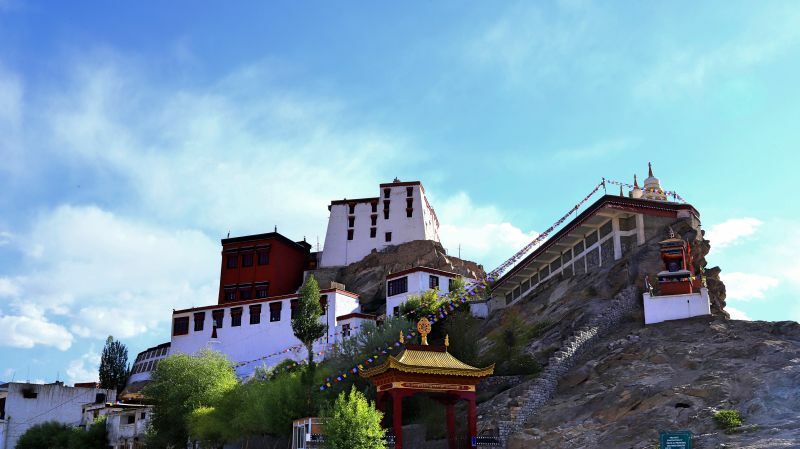 Hemis Monastery is the wealthiest and richest monastery in India. Built in 1672, this 17th century Gompa belongs to the Drukpa sect of Tibetan Buddhism and hosts the annual Hemis festival in the month of June-July to commemorate the birth anniversary of Guru Padmasambhava. This event is one of the most fascinating festivals in Ladakh. While we were on our way out from the museum, the sudden snowfall in the heat of June took us by surprise. Once we were done with Hemis Monastery, we went to Thiksey Monastery, located in Thiksey, at an altitude of 10,800 feet, near Leh. The monastery stands out from the rugged landscape in its stark red and white colour architecture. The Gompa houses about 10 temples, homes for monks, nunnery and assembly hall. We visited the Maitrayee Buddha and Lamokhang Temple which are one of the main attractions of Thiksey Monastery. Thiksey Gompa hosts the annual Gustor Festival in the month of October and November and the mask dance that showcases the skills of the monks wearing myriad masks to delight the audience. However, to reach the top of the Gompa is quite an arduous task. But the effort pays off when you get to witness a majestic and spectacular view of the entire Indus Valley plains from the top of the Gompa. Alchi Monastery is an offbeat attraction which we decided to explore during our sojourn in Ladakh. Nestled in Alchi region, about 70 kms from Leh, it is renowned for its well maintained 11th and 12th century wall paintings in Indo-Himalayan style. Situated at 10,200 feet, the Gompa has three main temples – Dukhang, the Sumtseg and the shrine of Manjushri. The religious information of Hindu deities and Buddhist kings are depicted intricately in the wall paintings inside the main shrines. 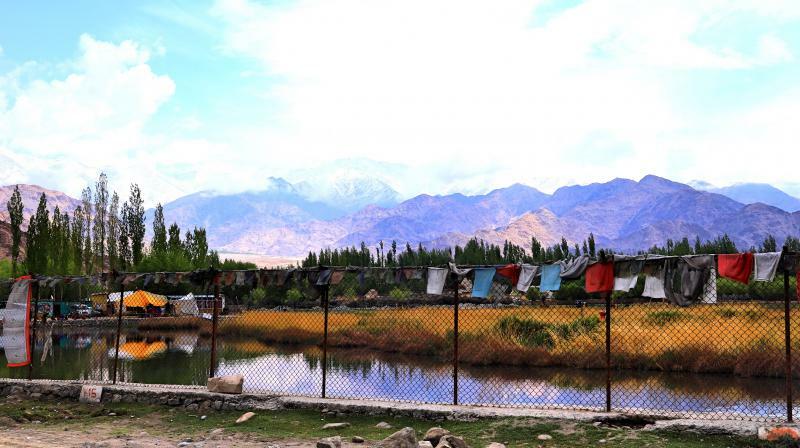 Situated in the banks of River Indus, Alchi is a tiny hamlet that is home to few homestays and restaurants. Once your way back from the Gompa, you can do a lot of souvenir shopping from the numerous road side stalls that yearn for your attention. We did our bit and we realised it was time for lunch. Though we had beautifully packed our food from The Grand Dragon Ladakh, we noticed a couple of restaurants and forayed into one of them. 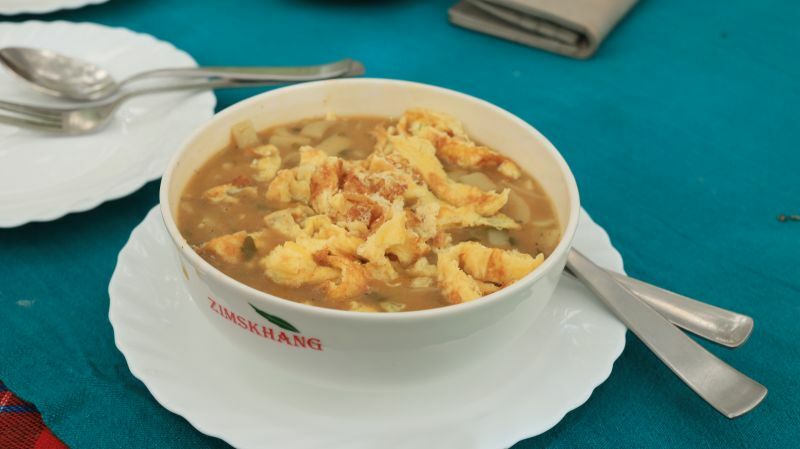 The restaurant quickly rustled up my order – Egg Thukpa – while my better half ordered Egg Noodles. 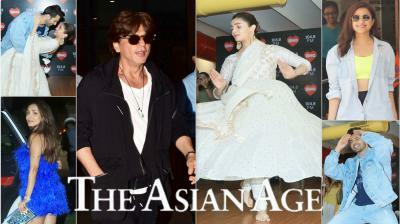 In a matter of no time, the restaurant was filled with Indian and international tourists. Traditional and authentic Ladakhi food is yet another irresistible reason to fall in love with Ladakh. The Grand Dragon Ladakh arranged a special session on Ladakhi food for us. The owner’s special chef was called in and he made delicacies for us such as ‘Mutton Momos’, ‘Mutton Keema Sausages’. These dishes were made in the traditional manner infront of us. However, we were told that the staple food of people in Ladakh are Sku and Thukpa, Pava and Khambir. You can also try among the several varities of locally made Apricot Jam and use it on your breads. When in Leh, try the local butter tea for a delightful experience. There’s more adventure in the foodie options as you can savour by entering the world of Tabak Maaz, Tigmo, Thenktuk, Yakhini, Mokthuk, Kahwa, Sea Buckthorn juice, Cholak and Ghustaba among other delicacies. After a rather 6 hours of bumpy and uneven road trip, we were waiting for the magical sight of the fascinating Pangong Lake to appear. We noticed it from a distance from our car, as our guide Tashi screamed: “There it is – Pangong Lake.” Our excitement was palpable. Finally, we made it. We have been hearing about it, seeing it in tons of youtube videos and dreaming to visit it. My last two visits to Ladakh were also not successful in making an attempt to the lake. The magical colours of the lake, clear, blue hues of the sky and the rugged mountain makes it one of world’s most fascinating Instagrammable places. Situated at more than 13,000 feet, the 160 kms long lake, the world’s highest salt water lake shares its magnanimity with both India and China. “You can visit China from there,” exclaimed Tashi, as we were busy filming its graceful and rugged appearance.